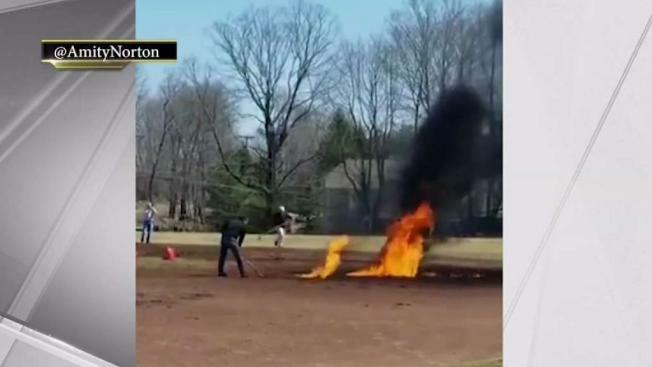 A baseball field in Connecticut is in shambles after 25 gallons of gas were dumped on a wet infield and set on fire in order to dry it out. Erica Byfield reports. The hope to dry out the infield before a Saturday Ridgefield High School baseball game resulted in flames shooting 15 feet into the air and an estimated $50,000 worth of damage. Tarps now dot the field at Governor Park since Ridgefield was subsequently forced to hire a spill crew to spend most of Saturday and all of Sunday removing the contaminated soil. It appears that about 15 to 20 parents took turns dumping the 25 gallons of gas on the field while more than a 100 people stood around and watched. Now that the bad soil is gone, state inspectors will be back later this week to test the ground. The question now is whether those that dumped the gas should be prosecuted and who exactly is responsible for the bills. “There will be some kind of financial restitution that is going to have to be made because it's not fair that the remaining residents of this community should bear the brunt of paying for something that was foolish,” Marconi said. The town's insurance company is now involved. The adjust told the town's leadership this is going to go down in the top three most bizarre claims he's ever seen.